Put on virtual reality glasses Gear VR and go from simple contemplation to real adventures that you just dreamed of. The new design of the Gear VR and the new controller give you a better perspective and the ability to move further than ever before. In the virtual reality world, it's easy to get lost, since Gear VR virtual reality glasses are designed to feel easier than they really are. You will also feel comfortable in them, regardless of the shape of your face, and the foam pad provides a tight fit and prevents the penetration of light inside. Full control of the games Use the Gear VR controller as a remote control to easily navigate through your virtual reality or use it as a gamepad with a trigger to win battles. The shape of the controller provides convenient use with one hand. A wide viewing angle of 101 ° through a large lens, as well as a smooth and accurate tracking of the position of the head with the built-in gyroscope and accelerometer will give you an unforgettable experience of traveling through virtual reality. No matter how far you are from your friends - thousands of kilometers away or living in a neighboring apartment - Oculus Rooms and Parties will be a convenient and interesting way for you to spend time together. Put the VR Gear on and set up the Oculus Room to take part in hot discussions or just have fun. The player is invited to connect the celestial bodies, using the controller Gear VR. As the various patterns are compiled, the constellations will come alive, recreating the animals, characters and memories of their youth. It does not matter which connector is used in your Galaxy device - Micro USB or USB Type-C. Just install the USB holder you need on the Gear VR and you're ready to dive into the virtual reality world. 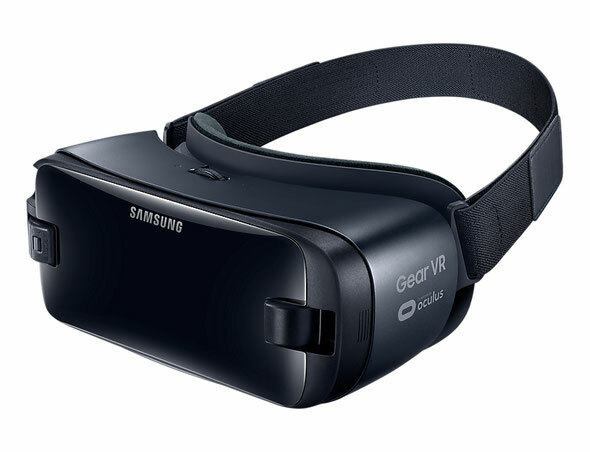 With the Gear VR, you definitely will have something to do with the presence of a large number of different games and applications for Gear VR, the number of which is constantly growing.